Italian sculptor, active also in England. 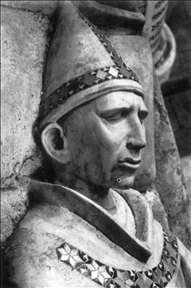 His masterpiece is the Tomb of Pope Clement IV in the church of San Francesco in Viterbo. He is conceivable identical both with the Odericus who in 1268 signed the inlaid marble floor of the sanctuary in Westminster Abbey, and with the Petrus civis Romanus who signed the now largely dismembered shrine of St Edward the Confessor, probably in 1269. The inlaid marble decoration of these two tombs is known as Cosmati work with geometric patterns characteristic of Roman workshops from the early twelfth to the beginning of the fourteenth century. See more details about "Tomb of Pope Clement IV"
See more details about "Tomb of Pope Clement IV "